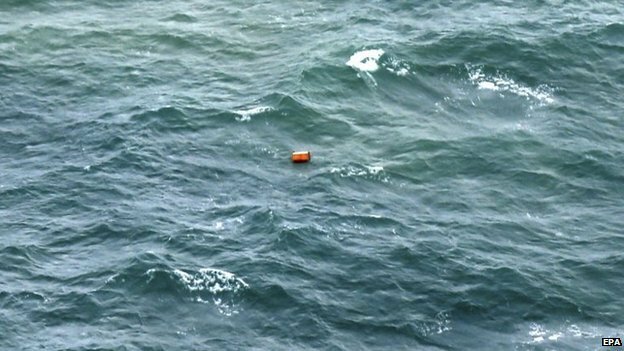 Two large objects have been found by search teams scouring the Java Sea for the wreckage of AirAsia flight QZ 8501, Indonesian officials say. A remotely operated underwater vehicle was being lowered to take pictures, search and rescue agency chief Bambang Soelistyo said. However, bad weather and heavy seas continue to hamper operations. The jet disappeared with 162 people on board while flying from Surabaya in Indonesia to Singapore on December 28, 2014. So far 30 bodies have been recovered in the search. No survivors have been found and the main sections of the Airbus A320 have not been retrieved. Most bodies are thought to have been trapped in the plane’s fuselage. Bambang Soelistyo said on January 3 that the large objects had been detected by sonar from an Indonesian navy ship. “We found oil slicks and huge objects at 23:40 last night. I am confident these are parts of the missing AirAsia plane that we are looking for,” he said. He said the larger of the objects was 32ft by 16ft but that strong currents made operating the underwater vehicle difficult. A flotilla of ships, including two from the US navy, are converging on the site where the objects were located and preparing to put divers into the water. The cause of the crash is not yet known. Specialist equipment has arrived to the search for the plane’s “black box” flight recorders, though officials say no signals have been picked up yet. In another development, it has emerged that AirAsia did not have official permission to fly the Surabaya-Singapore route on December 28 – the day of the crash – but was licensed on four other days of the week. The Indonesian authorities are suspending the company’s flights on this route with immediate effect pending an investigation, a transport ministry statement said. Officials have said the plane was travelling at 32,000ft when it requested to climb to 38,000ft to avoid bad weather. Some investigators are reported to believe that the plane may have gone into an aerodynamic stall as the pilot climbed steeply. There were 137 adult passengers, 17 children and one infant, along with two pilots and five crew, on the plane – the majority Indonesian. Four people have been identified so far: Hayati Lutfiah Hamid, Grayson Herbert Linaksita, Kevin Alexander Soetjipto and Khairunisa Haidar Fauzi.